Bugs in the building – is there an antenna in the top floors of the US Embassy in Moscow? US Diplomatic mission in Russia is facing some issue, since a couple of weeks ago Russia announced it has to reduce its personnel by 755 people. While it is an interesting move as a reaction to the tightening of the sanctions, we are not going to talk about politics. This turn of event made us remember the building of US Embassy in Moscow. Will it be empty now? Do you know why is it called New Office Building? First things first – US Embassy in Moscow is not going to be empty. Employees of US Diplomatic mission in Russian Federation are scattered around through a number of cities and different facilities. Also, while we’re on the subject, Russians are going to suffer from this the most. American citizens, who will be forced to leave this diplomatic mission, will go home and will receive positions somewhere else in the diplomatic corps. However, most of people who are getting fired since the 1st of September are going to be Russians. Furthermore, because of lack of human resources, some consular services will take longer to fulfil. So it is a nice publicity move, but it will mostly affect Russian people. It did bring our attention to the building though. The main building of the Embassy of the United States in Moscow, called the New Office Building, looks recently built. This is kind of odd, having in mind that US had an embassy in Soviet Union. We looked at why the building had to be changed and found out it was always getting spied. That had to be one of the motifs to move to a modern, more secure type of building. For example, bugs were discovered in the old office building of Embassy of the United States in Moscow in 1964. It was removed and everything was checked, but the spying eye did not look away from the building. In 1977 there was a mysterious fire on eighth floor of the building. Some valuable documents were lost. While we can be sure that some of them were lost in fire, some of them were definitely stolen. It is known that some of the fire fighters were KGB agents, who were well-informed about the structure of the building and information kept on that particular floor. And so a new building was needed. Fire did not damage the old office building too badly, but it was too easy to spy. Constructions were officially started in 1979 and in 1985 they found bugs in the new building. They were installed by construction workers or, more precisely, KGB agents dressed like construction workers. The spread of spying equipment was so vast it actually caused a bit of a diplomatic problem. 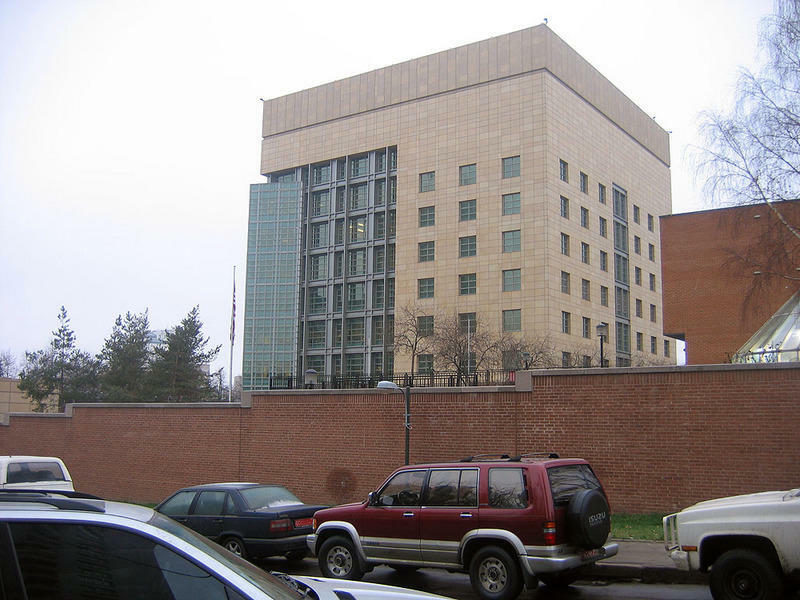 US did not let Soviet diplomats to move to their new embassy in Washington, until American workers were allowed to finish the construction of the new embassy in Moscow. Of course, before the building could be finished, part of it had to be destroyed, since the possibility of spying devices was so large. The New Office Building was finally opened in 2000. The top floors, built by American construction workers, are now used to deal with classified information, while the lower ones are dedicated to consular work. Still, who knows if it is not being spied at the moment, but some believe it is actually a piece of spying equipment in itself. The very top floors look different, because there are virtually no windows in them. Igor Korotchenko, editor of a magazine called National Defence (Национальная оборона) once commented that the top floors of the main building of the Embassy of the United States are actually an antenna listening to “Moscow air”. Although US does partake in a healthy dose of spying itself, this theory sounds funny and almost ironic, having in mind why these floors look the way they do. 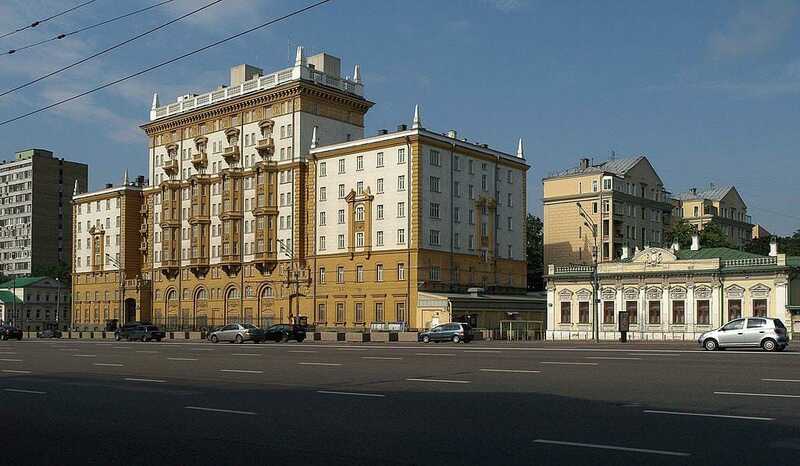 Posted in VarietiesTagged embassy, popular history, spying, US and Russia relationsLeave a Comment on Bugs in the building – is there an antenna in the top floors of the US Embassy in Moscow?